Geidy A. Achecar received her Bachelor of Arts degree in English from the University of Utah in 2003 and her Juris Doctorate from J. Reuben Clark Law School at BYU in 2014. During law school Geidy was elected as the Student Bar Association President and as the graduation speaker for her class. She was a member of the BYU Education and Law Journal and clerked in the appellate division of the Salt Lake Legal Defenders Association. After graduating and passing the Utah Bar Exam, Geidy worked in a Salt Lake firm before bringing her talents to the Fillmore Spencer team. Geidy’s family immigrated to the United States when she was a child, and she grew up in New York City. Being raised as an immigrant in a native Spanish speaking home in New York City provided Geidy with life experiences allowing her to relate to and help her clients in an extraordinary fashion. 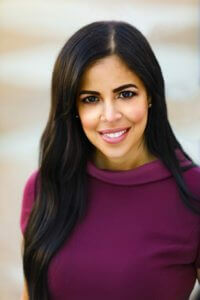 She passionately serves the Latino community in many ways separate from her law practice. She volunteered as the Co-executive director of the Utah County Hispanic Chamber of Commerce, she worked as a legal fellow for Senator Luz Robles of the Utah State Senate, and contributes her time to educate and assist Latino individuals in need. Geidy also takes advantage of every opportunity available to teach and model to young minority women that they can overcome adversity and change the world. Geidy shares her talents with several legal organizations including Women Lawyers of Utah, American Immigration Lawyers Association, and the Utah Minority Bar Association. Currently, Geidy serves on the board of the Utah Center for Legal Inclusion as co-chair of the education committee and she is serving her fourth year as a Truancy Court Judge in the Nebo School District. Geidy’s law practice focuses on personal injury-primarily auto-accident cases, immigration law, and divorce/family law matters.